Think that there are no large dog breeds for apartments? Think again! If you live in an apartment, but you’re not into small dogs, I have a list of the best big dogs for small spaces. Most people equate big dogs with being high energy breeds in need of wide-open fields to thrive, but there are several large breed dogs out there that make great apartment companions. Before you rush out and adopt one of these top five large dog breeds for apartments, it’s super, super, SUPER important that you talk to your landlord first. Many complexes have a list of banned breeds, and while these guys aren’t typically stars on that list, your building may have different rules. Some of these large breeds are, well, LARGE, so you need to be aware of any weight limits your landlord has imposed. You’ve heard that saying “it’s better to ask forgiveness than permission,” right? Well, when it comes to adopting large dog breeds for apartments, the opposite is true. The last thing you want to do is bring home a pooch that has been desperately awaiting a family, only to find out you have to give him back because your landlord says either he goes, or you do. Even if you own your apartment outright (rather than renting), buildings still have by-laws and what not dictating what types of dogs are allowed. Kind of like single-family dwellings in certain neighborhoods have HOA rules that you have to obey in order to remain in good standing in the community. Some of the best large dog breeds for apartments also make the best pets in general. Their laid-back nature not only makes them ideal for smaller spaces, but also for families with kids! Each of these dogs have a temperament that lends itself to the small area of most apartments, and their low energy levels mean that you don’t have to worry about them tearing the place apart because you haven’t exercised them enough. While originally bred as a war dog, the Mastiff is a wonderful companion for any family living in an apartment. They are an even tempered, easy going breed, however, if you or a member of the family is threatened, the Mastiff WILL step in to protect you. This isn’t a bad thing however, because this breed’s laid-back temperament means that if it feels the need to take action, you’re probably going to be glad for it. Although they can weigh upwards of 150 pounds or more, they think they are lap dogs. Like any breed, this behemoth needs daily walks, but it doesn’t need a hike or a run. A short, 30-minute walk is more than enough for it. The Dogue de Bordeaux is another excellent large breed choice for apartments. Remember “Turner and Hooch”? This is Hooch. Don’t freak out. They aren’t destructive like Hooch was in the movie. This dog will not eat your furniture or your shoes – unless you get a puppy. Puppies like to chew. The DDB, as it’s commonly called, is a highly loving, devoted, and protective family dog. This breed is one of the best large dogs for apartments, but it isn’t for the first time owner. Its highly stubborn nature makes it somewhat difficult to train, and puppies need to be intensively socialized to prevent aggression against other animals and unwanted aggression towards strangers. Although somewhat short of stature, the English Bulldog makes my list of the best big dogs for apartments because of its sheer weight and its even temperament. This pint sized mastodon, may be short, but it is still enormous. When I worked at the vet, we had an English Bulldog patient named Tank. He was every inch of his name. Although he was only about two feet high, he had a massive head and chest, and he weighed in at about 90 pounds. AND he wasn’t fat! He was just ginormous. The English Bulldog is the consummate couch potato. A short walk is all it needs for proper exercise. The rest of the time, it is perfectly content to watch television with you on the couch. Its loving, loyal, and even-keeled temperament makes it the perfect family dog, especially since this breed love kids. I mean, it LOVES kids. The Bullmastiff is another gentle giant that is one of the best big dogs for apartments. Known as “the silent watchdog”, the Bullmastiff is a highly loyal, loving, and protective breed. It’s not a killer though. It’s more of a road block. This breed can be extremely standoffish with strangers, but it will warm up to them. Because of its protective nature, it’s important to socialize this breed as a puppy. Mainly to teach it that it doesn’t have to protect you from EVERY stranger you meet. This breed only needs one good walk a day, and it’s good to go. After that, its main activity is laying around. Last, but most certainly not least, on my list of the best big dogs for apartments is the Saint Bernard. Although this dog can grow to big gigantic, it is the perfect dog for anyone who lives in an apartment. The Saint Bernard is known for its even temperament, loyalty, devotion to family, and overall cheerful demeanor. Although it only needs a daily walk for adequate exercise, a good romp in a dog park is nice if you have the time. Although it likes an occasional romp, the Saint Bernard is a very docile indoor breed. It needs to be with its people, and it is extremely patient with children. This is the kind of dog that is perfectly happy to be your heating pad on a cold winter night. 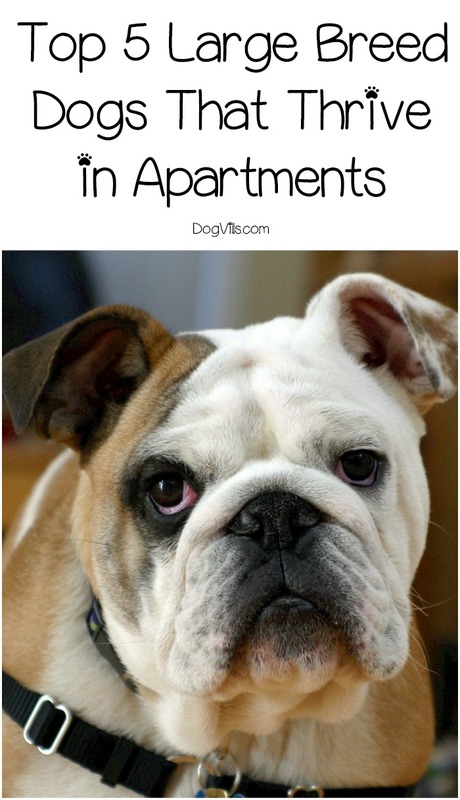 In my opinion, these are the top five best large dog breeds for apartments. They are all extremely loyal, loving, even tempered, and protective. These are important traits to have in a big dog if you live in an apartment. Their loyalty, devotion to family, and even tempers make them great for small areas. Their protective nature makes them great for apartment living, because with all of the people that live in an apartment complex, you just never know. As always, adoption is the best option. You can find almost any of these breeds at your local shelter or online at a breed specific rescue site. I highly encourage you to adopt whenever possible. I have had adopted dogs my entire life, and they always seem to be the most loving and loyal of all. It’s like they know where they were, and they are so happy to be in a loving home. I am 100% positive you can find any of these best big dogs for apartments available for adoption. Which of these large dog breeds for apartments would you love to rescue & bring home to your family? Tell us in the comments?